There is a sinister pathway that winds its sombre way across the northern wastes of Dartmoor, it is known as the ‘Way of the Dead’, the ‘Corpse Way‘, or the Lych Way. 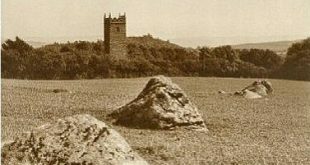 Its roots are firmly set deep in the days when every person on the moor was expected to attend their church for services and burials. That may not seem any different to the rest of the country in medieval times, except for some of them it involved a trudge of about 12 miles and in bad weather this would increase to roughly 17 miles. In the 1200’s colonisation of Dartmoor started by the founding of the Ancient Tenements which was mainly along the West and East Dart valleys and their tributaries. These early farmsteads were in effect freeholds and providing the King’s hunting was not ‘hindered’ there was no problem. The map below shows the sites of the tenements. One really atmospheric way of walking the Lych Way is to do it on a summer’s night and as the night slowly draws its mantle of darkness over the moor you can easily imagine the slow creaking noise of an old cart as it trundles the corpse to Lydford church. In parts, especially the section from Conies Down to Sandy Ford the sunken holloway can be discerned with wheel ruts still visible. The aerial photograph below shows the section of the path from Travellers Ford to Sandy Ford and clearly shows the track winding across between the two valleys of the Cowsic and the Spriddle Lake where it went on to Coffin Wood. One would have thought that with the nature of the Lych Way there would be scores of tales of ghosts and hauntings but surprisingly enough there is but one tale about ghostly funeral processions and monks. I have had an interesting experience this evening, and I have been trying to do some research as to why. I keep my horse liveried on the Lych Way at Stepping Stones. I was walking up the path from the stable to my car when I saw a tall thin black silloutte infront of me. I opened and shut my eyes as I just assumed it was a trick of the dark, but when my eyes refocused, it was still there moving along towards the left of my vision. I walked into it, still think it was a shadow of my eye and it would stay to my left but I actually stepped into the black. I was knock backwards off balance as if I had walked straight into someone although I didnt feel anything! I turned to the left to see what it was and saw a whole line of these tall black shadows going away from me across the field towards the stepping stones. I felt a shameful feeling like I had interupted a procession and hastily made my way back to the car! There are several stories about such processions along the Lych Way but it’s a case of only those who have experienced them can comment – thanks for your post.